Pacman Swirl is with advance design from traditional slam a winner type game, amazing with realistic sound effects with great game play, this Super Swirl is an unique four player position game, comes with Jackpot payout to attract any player, add with 3 different playfield layouts and adjustable jackpot. All players have the opportunity to aim directly for the Big Ticket prize in the overhead LED display each and every time! - players press the button to release the ball and watch it swirl down the brightly lit ramp onto the rotating play-field. 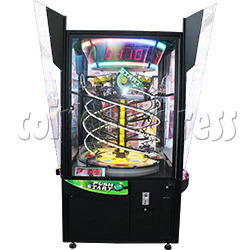 - the rotating play-field is equipped with several holes of varying ticket values for the ball to fall into. - the Jackpot holes are located on the perimeter of the playfield.